Auctioneers who allow consignors to grade coins have an obligation to set the record straight. We seldom bid in this auction because we disapprove of its continuously hyped grades. Grading is subjective–to a point. Imagine a beat-up 2003 Chevrolet Silverado 1500 Regular Cab worth about $5,000 with a sale price of $65,000. That’s the level of exageration here. Expand the photo above to see coin after coin listed at MS68. The photos are subpar, so you cannot truly grade these coins, although we see bag marks in several and washed out (dipped?) luster in others. We can’t be sure because of the poor quality photo; but we can be relatively sure that these are common uncirculated Morgans at best worth anywhere from silver melt to $100. When we see auctioneers stating “Consignor’s Estimated Grade” in an auction that schedules weekly coin sessions on Proxibid, we expect the auctioneer to know something about coins and counter hyped descriptions by sellers. And please, no more–we’re auctioneers, not coin dealer excuses; if you’re scheduling regular coin events on Proxibid, guess what? You’re a coin dealer. 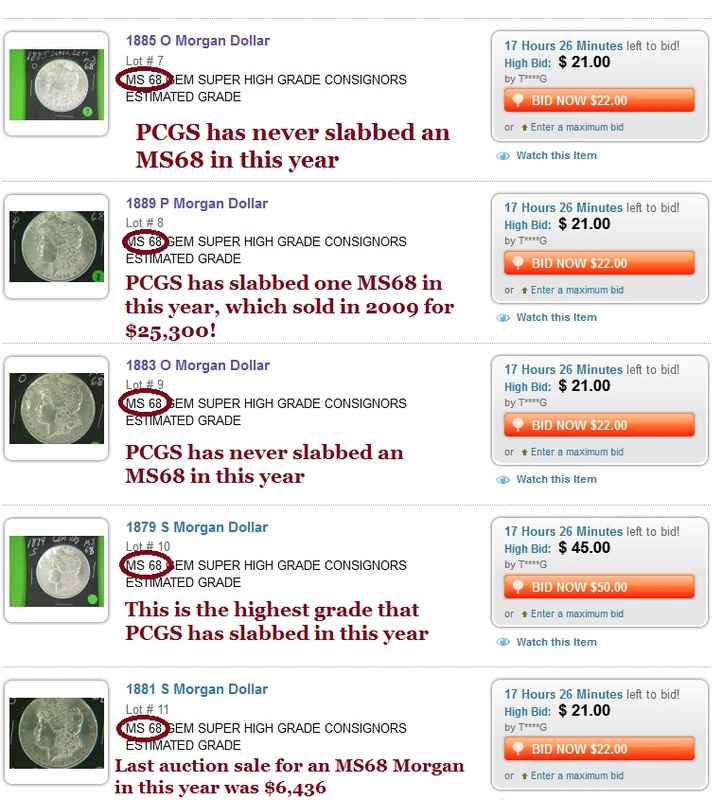 To see how to grade and describe coins, visit archived sessions by Capitol Coin Auction, SilverTowne and Leonard Auction. This entry was posted in Best Practices, Uncategorized and tagged American Numismatic Association, Auctioneers, AuctionZip, Best Practices, Coin Auction, Howard's Coin Shop, Leonard Auction, National Auctioneer Association, Proxibid, Proxiblog, Silvertowne Auction. Bookmark the permalink.